There is a lot to love about Folsom. On warm summer days, Folsom lake and the American River offer a cool relief from the hot, Northern California sun. Miles of multi-use trails wind through the city, taking cyclists and runners through scenic and shaded paths. Historic downtown’s galleries, restaurants, pubs and nightclubs offer art and entertainment seven days a week. The Johnny Cash Trail Art Experience. What is the Johnny Cash Art Experience in Folsom? The answer? In short, the Johnny Cash Trail Art Experience is a tribute to Johnny Cash and his connection to the City of Folsom. It’s a beautiful park. It’s a public art installation. It’s a stunning overpass. It’s a multi-use trail. If you live in Folsom, you have probably driven past the Johnny Cash Overpass Bridge, where Folsom Lake Crossing meets East Natoma Street. 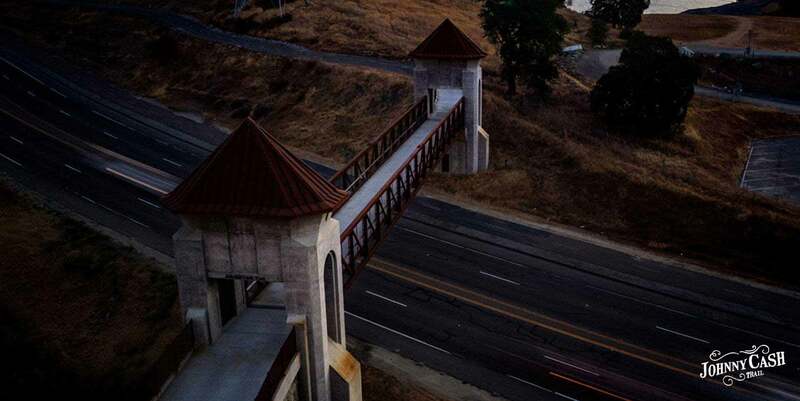 The overpass design was inspired by the East Gates of Folsom Prison and marks the beginning of the Johnny Cash Trail. When the project is completed, the Bridge won’t be the only landmark visible as you pass by the trail. On either end of the trail, visitors will be able to experience a public art installation unlike anything Folsom has ever seen. The Johnny Cash Trail Art Experience will include larger-than-life sculptures made from bronze, stone, and steel. An interactive app will allow you to learn more about the art along the trail, as well as the history and music of Johnny Cash as you explore the exhibit. The completed project will also include a new park for Folsom residents and visitors to enjoy: the Johnny Cash Legacy Park. Picnic in the grass under the shade of a towering statue of the Man in Black, or let your kids play in the sun while they learn about the unique history of our town. When Will the Johnny Cash Trail Art Experience be Completed? The Johnny Cash Trail and Overpass bridge are the completed first phase of this inspiring project. You can head on over to the trail today and bike, run, or walk the scenic 3-mile pathway that stretches from the bridge to the American river. The trail takes you past the prison, and along the way showcases some truly stunning views. Now that the trail is complete, the City of Folsom is eager to see the next phase come to life: the art experience. The Johnny Cash Trail Art Experience is being made possible through private donations, and is expected to be completed in 2018. If you want to be a part of this unique community project, please visit our Contribute page to learn how. Whether you come to enjoy the art, the experience, the park, Folsom’s scenic beauty, or the trail itself-- the Johnny Cash Trail Art Experience will have something for everyone. What will you love most about the Johnny Cash Trail?